Introduce your children to talking with God as they follow the simple rhymes and prayers in this delightful book. Illustrated with colourful pictures, the prayers cover topics from special days and food to families and nature. Ages 2-5. First Prayers is an anthology of traditional and contemporaray prayers presented in east-to-find sections for all occasion, with an index of first lines. 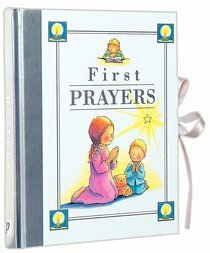 :First Prayers is an anthology of traditional and contemporaray prayers presented in east-to-find sections for all occasion, with an index of first lines.